After many twists and new stories emerged during the season fifteen premiere, it’s time to see how each of our favorite TV doctors was affected by the changes that are coming to Grey Sloan Memorial. Romances are ignited, new positions begin, and the wrong way to handle patient care all play major roles in this week’s episode. While “Gut Feeling” is a bit choppy to watch, here’s what you need to know going into the first big Grey’s Anatomy and Station 19 crossover event of the fall. Roughly six days have passed in show between the events of the two-part premiere and the beginning of the third episode. Jo and Alex start their new jobs at the hospital as Bailey’s fellow and interim chief of surgery, respectively. Upon entering the hospital, Jo attempts to make people stop calling her Dr. Wilson and start saying Dr. Karev. It is pretty surprising that Jo would take Alex’s last name professionally, since they still work in the same hospital; but it is clear that she wants to start a new chapter in her life and fully be detached from her past. Jo’s new position also comes with a graduation from the light blue to the navy scrubs! The new Jo Karev emerges when she officially graduates from resident to fellow by standing up to Bailey. For most of the episode, Bailey is so preoccupied with checking up on Alex and not being chief of surgery that she won’t give Jo the time of day to start on their projects. Jo quickly grows frustrated and finds Meredith for support. Jo wants to work with Meredith again; but like the good mentor Meredith is, she tells Jo that she and Bailey are now equals. Meredith explains to Jo that she has to stand up for herself and see the fellowship as a partnership with Bailey. A reluctant Jo takes Meredith’s advice and confronts Bailey about her lack of attention. Jo’s newfound confidence snaps Bailey out of her funk and makes her respect her new partner. The other Karev has an even tougher first day on the job. I think it’s safe to say that everyone in the audience and the show except Alex knew he would be in over his head with the interim chief of surgery job. His first act as interim chief is to make his doctors happy, so he signs a bunch of requisition forms for projects that the doctors want funded. One of them includes a new $65,000 3D printer for Link to make custom superhero-themed prosthetic arms for his patients. Unfortunately, Alex winds up misreading his budget reports and spends the entire budget for the quarter in one day, leading to a very comical conversation between him and Bailey. Alex quickly becomes overwhelmed when his plate gets stacked too high with everyone else’s mistakes. The nurses aren’t happy that the operating room schedules are disorganized, patients are mad that Alex has missed appointments, and several people in the emergency room are looking for answers that Alex can’t give. The staff starts to doubt that Alex can handle his new position. On top of all that, Alex is in charge of intern Roy, who is back following his accident in the OR during the premiere. Alex’s day gets worse when he has to deal with two cases of doctors mistreating patients. First, he has to kick Richard out of the OR (but more on this later). Second, he doesn’t keep a good enough eye on Roy, who majorly screws up for the second time in a week. A young man comes into the ER with a nose that won’t stop bleeding. Roy simply sits him down on a bed and tells him to apply pressure and lean forward without doing any sort of exam or blood work. Five hours later, the patient’s nose is still bleeding, and blood starts pouring out of his mouth. Tom Koracick is walking by as this occurs and tries to help Roy save the patient. Roy’s mistake of not examining his patient leads to the man’s death. Alex is so angered by Roy’s lack of medical ability that he fires him, which will probably stick for good this time. Another character with a lot on her plate in this episode is Maggie, who is weighed down by Teddy’s secret pregnancy and an imploding relationship. 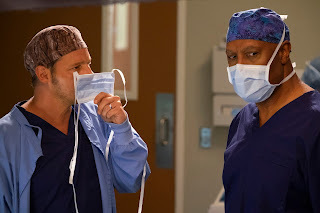 Jackson, who doesn’t appear in the episode, decides to email the hospital staff and leave Maggie a voicemail to say that he is taking a leave of absence to clear his head and find himself. He is clearly still struggling with the concept of faith, which will be a continuing storyline down the road. Maggie doesn’t know how to handle being left, so she spends most of the episode freaking out and taking her emotions out on other people. Before she even knows that Jackson left, Maggie tries to set Amelia up with DeLuca and Link. Maggie goes so far as to have a big argument with Owen because she doesn’t want he and Amelia to be together, since she knows that Teddy is pregnant with Owen’s baby. Of course, Teddy is still out of the picture and doesn’t appear in the episode to ruin Owen and Amelia’s honeymoon-like high. Maggie is quickly spiraling out of control, and it doesn’t appear that she will keep it together for much longer. She is always pretty unstable, but Jackson randomly leaving may finally put her over the edge. One of the bigger storylines of the episode involves Richard’s poor treatment of a patient who is suspected of being a drunk. A teacher and two students are brought into the ER after the teacher passed out in woodshop class, partially cut off two of his fingers, and pushed a kid into a blade. Blood tests show that the teacher’s blood alcohol content was through the roof at the time of the accident, which enrages Richard. As we all know, Richard has not been doing very well since his sponsor Olive died at the end of last season. He has yet to find a new sponsor and it is implied that he hasn’t been going to AA meetings. Richard is so miffed by the patient putting children in danger that he snaps. At first, Richard tries to get the patient to admit that he was drunk in class. The patient insists that he doesn’t drink, which makes Richard think he is a liar and an alcoholic. Richard continues to pressure the patient and follows him into the OR to watch him sober up. As Link amputates two of the patient’s fingers, Richard nastily tells the patient that he has a major problem and needs to admit to his alcoholic ways. Richard goes so far that Alex is called into the OR to deal with the situation. Alex decides to throw Richard out of the surgery for his mistreatment of the patient. Richard goes back to the ER floor and is pulled aside by one of the student’s parents to ask for the status of the teacher. The parent tells Richard that she knows that the teacher doesn’t drink and that something doesn’t add up because he is a great person. Richard doesn’t appear to believe the parent, and he goes into the patient’s recovery room to offer him a cup of vodka to help with his alcohol withdrawal. A little while later, a very angry Link and Alex storm into Richard’s office to confront him about why the patient’s blood alcohol content is through the roof again. Link accuses Richard of giving the patient alcohol, and Richard says that the patient wouldn’t accept the cup that actually contained water, not alcohol. Richard explains that he was testing a theory and realized that the patient has a very rare disease where the bacteria in the patient’s intestines turns sugar into yeast, which skyrockets the blood alcohol content and makes a person appear to be drunk. Even though Richard solved the case, he needs a major attitude adjustment. He is screaming for help without knowing it and needs to find some before he goes off the deep end. Hopefully this patient is the wake-up call he needed. Lastly, Meredith has an attitude adjustment about her love life. She is still treating her matchmaker patient CeCe, who appeared in the premiere, and doesn’t want to open up to get advice on her love life. CeCe tries to make Meredith answer a bunch of personal questions so she has a better idea of what Meredith will want in a new relationship. Meredith is just being Meredith by taking a lot of convincing to answer the smallest of questions. Since she is so closed off, CeCe tells Meredith that she needs to start small and go shopping to pick out five new outfits to wear on potential dates down the road. Meredith decides that this is a fair compromise and starts to open up to the idea of finding love again. Since this is the season of love, it does seem like Meredith will let down her guard a bit and let some new men in. But let’s hope DeLuca isn’t one of them.